Whenever people are struck by gold fever and a gold rush begins, inexperienced prospectors come across iron pyrite and think it is real gold. To an overexcited miner, iron pyrite -- commonly known as fool’s gold -- does have characteristics similar to real gold. Their disappointment is all the more intense when they realize that they have been fooled. Whether you are prospecting for fun or for profit, learn to recognize the telltale qualities of iron pyrite. Perform a streak test. Scratch the nugget against a white ceramic tile. Look at the streak that the mineral leaves behind. If it is a greenish black color, you've found fool's gold. Real gold produces a golden yellow streak. Test the mineral’s hardness. Use the blade of a pocketknife to slice the surface of the specimen. Brush away any dust and look closely for scratch marks. Iron pyrite is too hard for a knife blade to affect, but pure gold is soft and will show a scratch. Hit the specimen with a hammer. If you strike a piece of pyrite against hard metal or flint, you will get a spark. This well-known quality gives the mineral its name -- pyrite is Greek for "of fire." 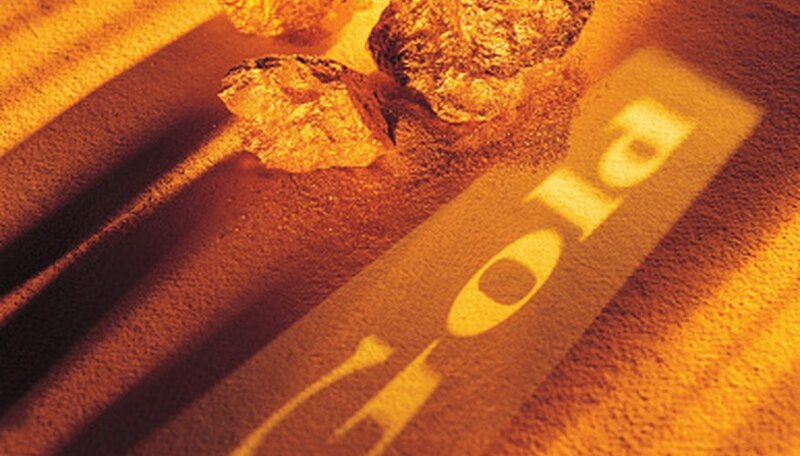 Real gold will produce no sparks and should flatten under the hammer’s force. Look for physical differences. The color of iron pyrite is like pale brass, and it usually occurs in a crystal form that may look like a cube or an octahedron. The color of real gold is a metallic yellow. It's more often found in nugget form, rarely in a regular crystal shape. Sniff the rock. Give the specimen a good rubbing and take a whiff. Gold is odorless, but iron pyrite will have a rotten-egg scent. Contributor. "How to Tell Fools Gold from Real Gold." Sciencing, https://sciencing.com/tell-fools-gold-real-gold-4735330.html. 24 April 2017.